Blue: Alchemy of a Colour is a small exhibition currently on at the NGV. It opened in November and runs until the beginning of April, and explores the artistic use of cobalt and indigo in pieces dating back as far as the seventh century. The works were mostly ceramic – cobalt pigment – and textiles – indigo dye. No prizes for guessing what I was there to look at! 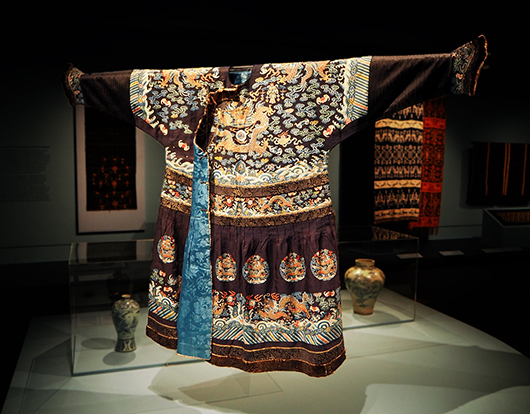 Chinese formal court robe from the mid 19th Century. Silk, fur, silk and metallic thread, gilt; slit tapestry weave. The works are from Asia and Europe, and for a small collection they showed an impressive range of techniques from ikat and batik, to boro, shibori and supplementary weft weaving. Since learning to do the latter in Mexico, I always take particular interest in those. Given it took me about a week to weave this, I simply cannot get my mind around weaving something like this ceremonial piece below. How on earth would you keep track of which threads you were putting under, and which over? 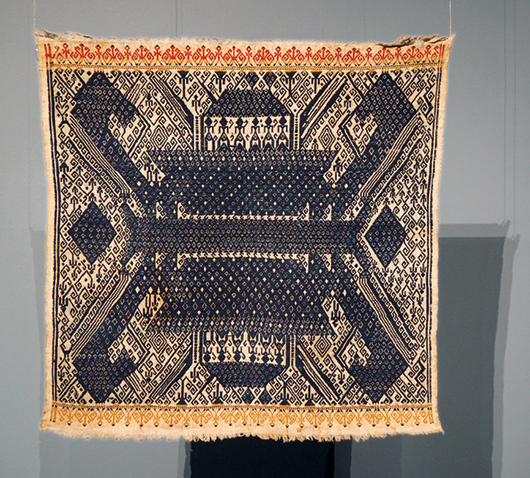 Tampan (ceremonial textile), Paminggir people, Sumatra, Indonesia. Cotton dyes; supplementary weft weaving. One of my favourite pieces was this Japanese boro kimono. It's a bit hard to see in the exhibition because it's lit from behind, but I love the mending upon mending – layers on layers stitched together with sashiko stitching for extra strength and warmth. 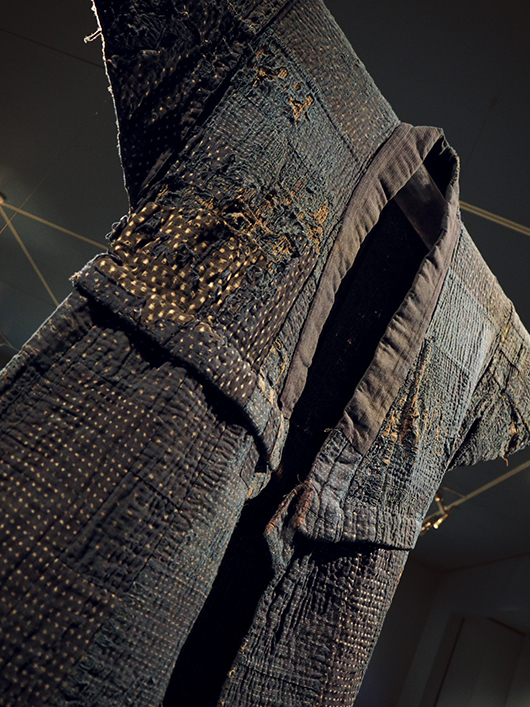 This rag kimono was probably worn by a poor rural worker, as blue cotton garments were commonly used in Japan at this time to signify the working class. Rag kimono, 1900-50 Japan. Cotton, indigo; resist dyeing (kasuri), quilting, sashiko stitching. Which brings me nicely to the project I'm currently working on. It's a quilt made from recycled jeans I've been collecting from friends and family as well as the odd op-shop. I'm cutting really large pieces which means I need big, tall mens' jeans for the biggest of them. I think I'm about a week away from finishing the top, which is currently spread all over the floor. Here's where the Blue Giant quilt started. The quilt pattern is available at my Etsy store. At this stage I'd usually photograph it so I can put it away and then lay it out again the same way, but given all the pieces are essentially the same colour I'm not really sure that will work. The alternative is normally numbering the pieces, but I can't quite figure out how to do that either. I guess it's just going to have to live in this very inconvenient spot until I'm done! Getting underway with the Blue Giant quilt pattern. 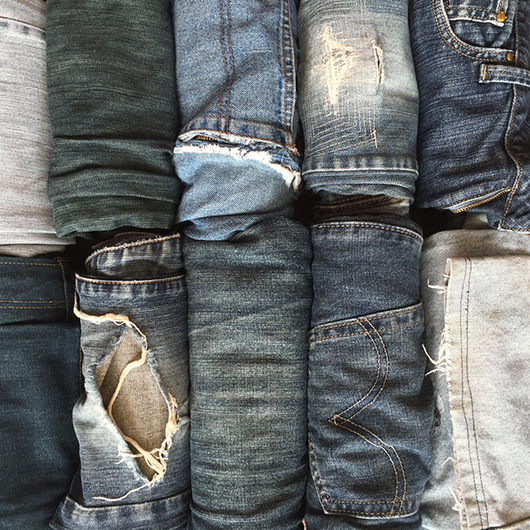 I suspect I'm going to have an awful lot of denim leftover too. Often it's only the backs of the legs that are wide enough for what I'm doing, so I already have plans for a Maura Ambrose, Folk-Fibers style improvised quilt after this one. 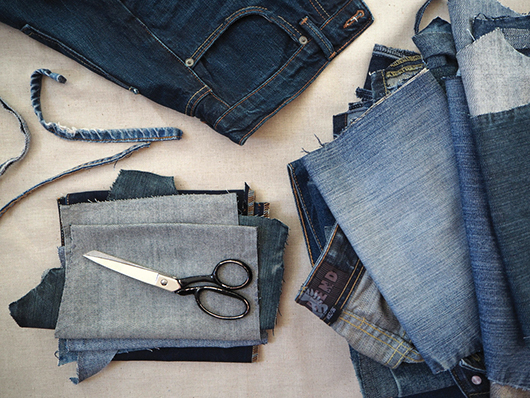 Let's just say, I think I'm going to be vacuuming up a million tiny denim threads for a while yet.